While Soft-Ride is best know as the originator of the Comfort Boot, we make a number of products to treat injury and disease and help your horse recover from a hard day’s work. Please note: the products on this page are for purchase by veterinarians only. Soft-Ride’s Cast Rocker is an innovative podiatric device that—when fitted on the bottom of a leg cast—enables a horse to find a naturally comfortable foot position and protects the bottom of the cast from water, dirt and abrasions. 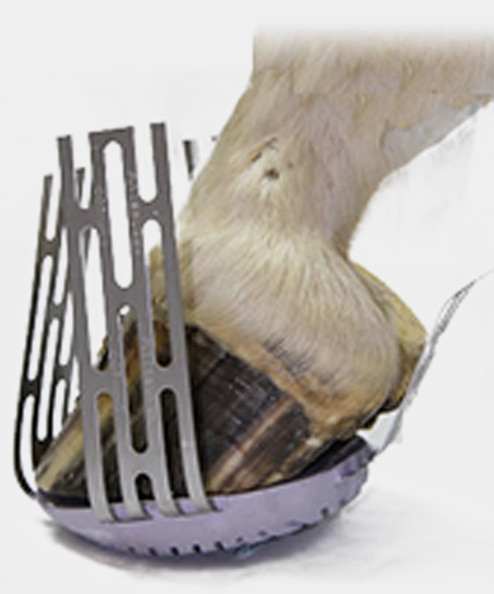 The Cast Rocker greatly reduces the ground contact area for a horse with a leg in a cast. For example, a typical cast bottom has about a 64 square inch footprint. A Cast Rocker can reduce that footprint to about 20 square inches, thus enabling your horse to find a more comfortable foot position when standing. It can be easily installed when a conventional, fiberglass cast is applied. As casting tape is applied to the leg, the stainless straps of the Cast Rocker can be incorporated into the last layer of casting tape, thus ensuring a secure fit. "I began using Soft-Ride boots in early 2009. I have hauled my two good horses, Oz and Flip, as much as ever and have given no Bute or Banamine. I don’t want to have to use pain relievers to do my job and I don’t want my horses to either. This great product have allowed my horses to be drug free." 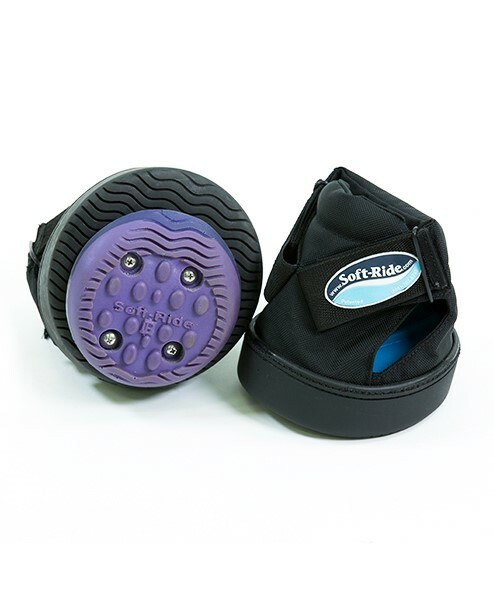 The Soft-Ride Super Rocker is a prescription-only, non-invasive podiatric device that attaches to the bottom of a Soft-Ride Comfort Boot. It enables a horse to find a comfortable, natural position to relieve stress on a sore, injured or diseased hoof while reducing tension on tendons and ligaments. For a horse in a cast, a Comfort Boot with the Super Rocker attachment can be used on the opposing limb to counter leg length disparity. We recommend that the device first be taped to the Comfort Boot and x-rayed with the hoof in the boot to determine the proper rocker alignment for the position of the coffin bone relative to the ground. When proper positioning is achieved, the Super Rocker can be attached to the boot with the included fasters. "Our equine practice loves Soft-Ride Boots! We see mostly performance horses, and Dr. Barrow prescribes them for many of her rehab cases. She has used them on everything from founder to pedal osteitis, and from contracted heels to navicular disease. We always keep a hew pairs around to loan to our rehab cases, and many times we end up ordering them a pair of their own for future comfort when traveling or being stalled on harder surfaces. Dr. Barrow believes in Soft-Ride so strongly that her horse (AQHA Superior Trail and Western Riding) Sterling assets, never travels without them!"